Mark Dotzour delivers 60-100 speeches each year to a wide variety of audiences. His goal for each of his presentations is to synthesize global, social, and economic trends to give his audience a tool kit of factual information to help them make good investment and business decisions. His audiences include virtually every facet of the real estate industry, and accountants, wealth managers, bankers, private equity funds and foundations. Each presentation is individually tailored to meet the needs of the audience. To help make my presentation run as smoothly as possible, I’ve assembled the following information. The topics typically covered in my speeches include the outlook for job growth, interest rates and inflation. For many audiences I also talk about the outlook for absorption of commercial real estate, trends in commercial real estate values and transaction volume. I also discuss the outlook for home sales volume and residential prices for brokers, home builders, developers, lenders and investors. “I realized that I need to be the 50,000-foot guy who sets the picture in terms of what the overall market condition looks like." 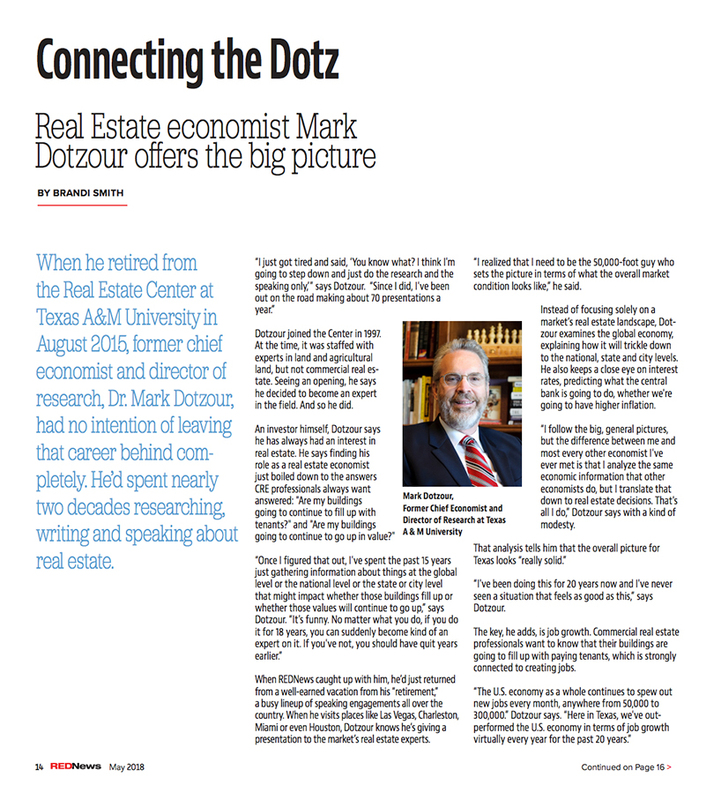 Instead of focusing solely on a market’s real estate landscape, Dotzour examines the global economy, explaining how it will trickle down to the national, state and city levels. He also keeps a close eye on interest rates, predicting what the central bank is going to do, whether we're going to have higher inflation. “I follow the big, general pictures, but the difference between me and most every other economist I've ever met is that I analyze the same economic information that other economists do, but I translate that down to real estate decisions." Read the full pdf REDnews article.